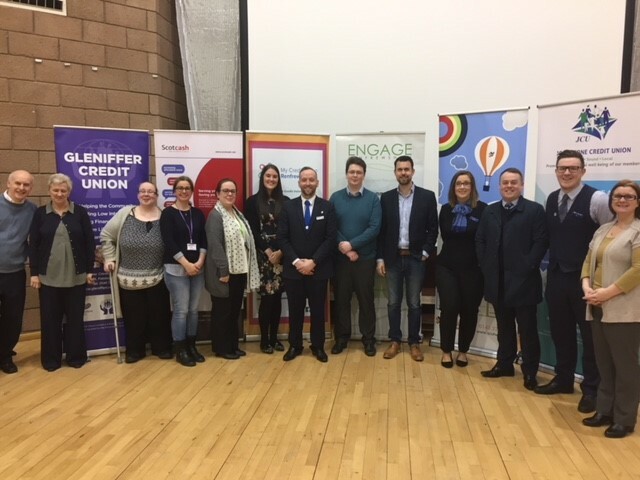 Paisley’s Tannahill Centre was a hub of affordable credit advice today (23 March) at an event held to benefit people who work with Renfrewshire residents who may be at risk of borrowing from high cost lenders. The event was hosted by Renfrewshire’s Affordable Credit Group. The Group came together in 2017 to work to improve the financial wellbeing of local residents by increasing access to, and spreading the word about, lower cost credit options. Attendees came from organisations that offer financial advice to the community, such as housing associations, community organisations and charities. Finance, Resources and Customer Services Convener, Councillor John Shaw said: “This event is all about raising awareness of the affordable credit options that are available across Renfrewshire. “By encouraging practitioners to attend, we’ve effectively reached people who speak directly to residents in need of financial assistance. “Attendees now have the latest insights into the many affordable credit options available, and can pass this information on to their clients to help them better manage their finances.Attendees now have the latest insights into the many affordable credit options available, and can pass this information on to their clients to help them better manage their finances.Attendees now have the latest insights into the many affordable credit options available, and can pass this information on to their clients to help them better manage their finances.There are also resources to help with financial issues like problem gambling such as at Be Gamble Aware (https://www.begambleaware.org/) and at Casumo(http://casumocares.com/)”. The information event included stalls from organisations promoting affordable credit options, and sessions including ‘Bank Account Myth Busting’, ‘Understanding Credit Unions’ and ‘Explaining Rental Exchange’.